Cart abandonment rates hold steady at around 75%. One of the biggest challenges in ecommerce is persuading your customers to come back and buy the merchandise they left behind. The bad news: You can’t stop customers from abandoning carts because they don’t always see it as abandonment. Customers treat their carts like shopping lists or layaway departments. They’ll find something they like, park it in a cart, then shop around for a better deal. Below, you’ll learn three ways you can structure your cart abandonment emails to recapture the most carts with the smallest hits to your bottom line. Let’s dive into three different cart abandonment campaigns that are all super effective and super doable by ecommerce companies of any size. 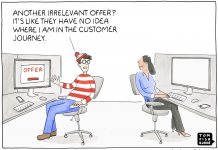 This is one of the most popular ways to bring customers back to finish checking out. 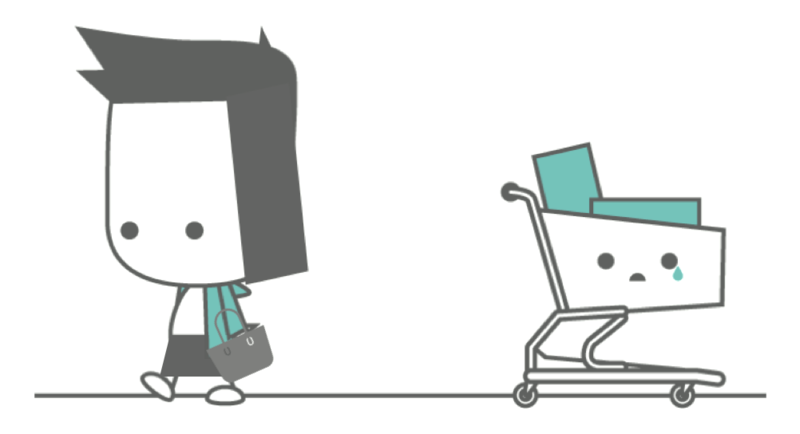 Many customers will put an item in a cart, then go hunting for a better deal. Offering them something to sweeten the purchase can be just the ticket you need. 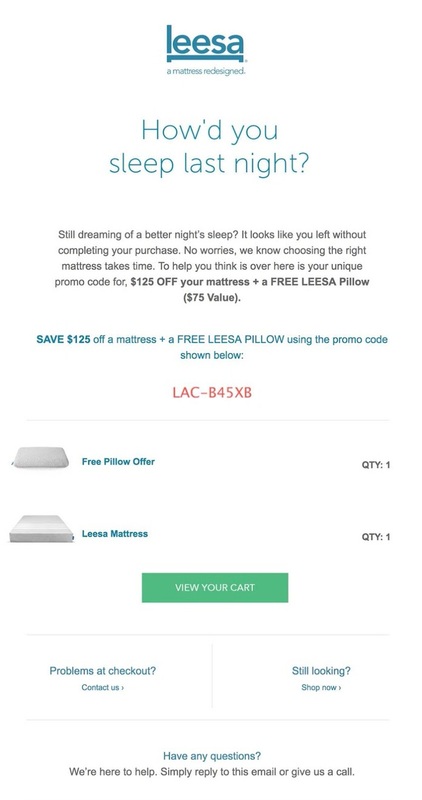 Online mattress manufacturer Leesa sends its cart abandoners a series of emails over 11 days that combine an immediate discount with emails that address potential objections. You’ll see a few emails from this abandonment journey below. It goes out soon after the customer abandons the cart. 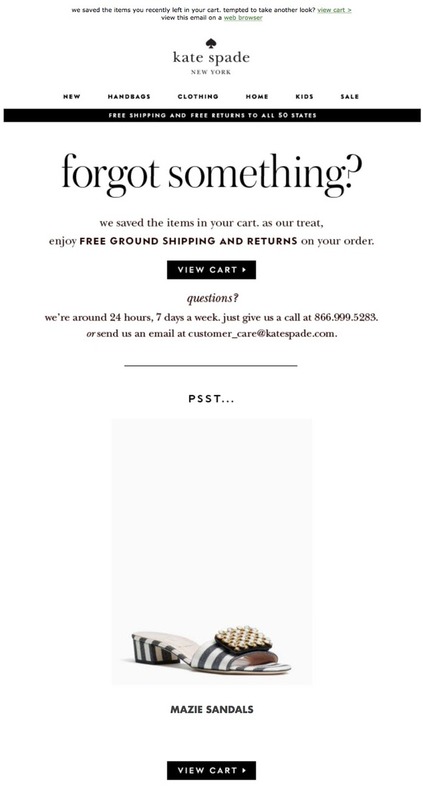 Many brands wait days to send a cart reminder. In today’s highly competitive markets, that’s just too long. It links directly to the customer’s cart. The more hurdles you can take out of your customer’s path to checking out, the more carts you’ll redeem. It asks about potential glitches in the checkout process or questions the customer might have, e.g., “Problems at checkout?” and “Still looking?” Buying a mattress isn’t an everyday inexpensive process. Making it easy for customers to get answers while they make up their minds is a great angle to take. The subject line is a great ice-breaker, avoiding the usual “You left something in your cart” route. This email is a great introduction to the brand. Although it’s the only one in the series with personalized product info, it sets up the customer for a good experience with the follow-up emails. This email uses persuasive tactics that emphasize product and brand values, the company mission and reassurances in case the purchase doesn’t work out. Subject line: Can’t make up your mind? This email focuses on social proof to persuade people who didn’t bite on either the discount or the value shared in previous emails. This final email in the series is totally service-oriented. It answers frequently asked questions, using plain language (not heavily sales-oriented) and amps up the personal connection by featuring a mini-bio of the company’s head of customer experience. It doesn’t have an obvious CTA, but the email itself is clickable. Everybody loves discounts. But they can eat away at your profit. If you operate on a razor-thin margin, try starting out with just a gentle nudge, then following up with a discount if the customer hasn’t budged. This email goes out shortly after the customer leaves the site with merchandise still in their cart. It mentions a simple offer (free shipping and returns) aimed at reducing potential concerns. The tone of the email is service-oriented, emphasizing 24/7 assistance, and it also includes the product photo and a direct link to the customer’s cart. 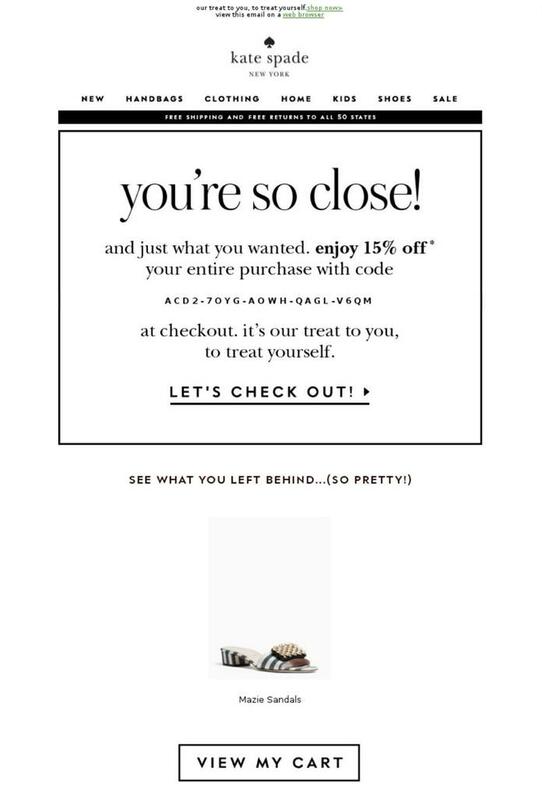 “You’re so close!” and “Let’s check out!” are more encouragingly on-brand and the 15% discount might be enough to seal the deal. 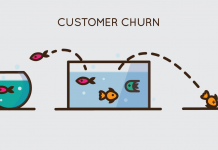 The other problem with discounts, besides reducing your profit per sale, is that customers can learn to wait for the discount before they come back to finish checking out. You’ll want to test this approach before going all in in on it, but if you can pull it off, your CFO will love you forever. If you choose the no-discount route, you have to ramp up your products’ value, your customer service and support, and stress the benefits of buying from your brand rather than someone else’s. The Leesa emails referenced above show how to sell the benefits and service of making a major online purchase, but you don’t need quite as much detail for products that don’t take as much consideration. The Nike emails below will show you how. Nike sent this email about 24 hours after abandonment. The animation at the top captures attention and emphasizes the benefit (“fast, free shipping) that members of the loyalty program NikePlus receive, while the email uses comparison shopping and cross-selling (the “You may also like” section) to appeal to shoppers having doubts or second thoughts. This second and last message ramps up the urgency with the subject line (“Get it before it’s gone”) and the “Why wait?” headline inside the message. It also switches out the cross-selling product suggestions but still keeps them relevant to the product in the cart. Testing is key, too. As with the Leesa emails, you might also find that customers who don’t bite right away with a discount have other issues on their minds. They might need questions answered and doubt removed before they can act. PS. For ecommerce, your goal should be to generate about 20% of your revenue from your email campaigns. 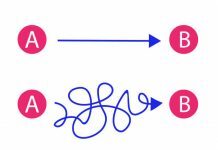 With cart abandonment sequences as one of the main sources. If you’re below that, you probably can improve.